iZombie has a premiere date! The comedy/horror/murder mystery show launches March 17 on the CW. 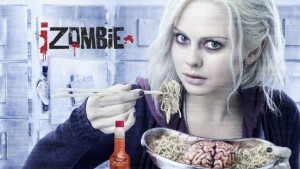 I’ve been describing iZombie as a mash-up of the Robeson/Allred comic’s premise (woman becomes a zombie, but can keep her mental faculties as long as she eats one brain a month…then starts picking up memories and personality quirks from the brains she eats) with Pushing Daisies (someone able to communicate with the dead in an odd, but limited manner teams up with a detective to solve murders) and Veronica Mars (produced by Rob Thomas and Diane Ruggiero), all of which sounded promising, since I liked the iZombie comic, Pushing Daisies, and Veronica Mars. Based on the previews I’ve seen online and at SDCC last summer, that description is (if you’ll pardon the expression) dead-on. CW has the first look trailer for the show. ComicBookMovie has the official synopsis of the show. Rose McIver stars as the main character, Liv, who takes a job in the coroner’s office to satisfy her need for brains, but gets found out by her boss…who is actually quite fascinated. As she picks up memories and skills from murder victims, she helps a detective solve cases while seeking the man responsible for her own zombification. The Hollywood Reporter has an extensive article talking with the producers and stars about the show’s tone, characterization, how Liv differs from Veronica, the nature of zombies on the show (if they don’t eat brains regularly, they turn into classic Romero-style zombies) and so on. It looks like it will be a lot of fun, and while it’s got half-season-wonder written all over it, you never know. 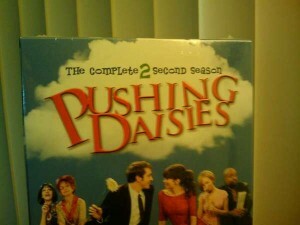 I mean, the fact that we got a second season of Pushing Daisies qualifies as a television miracle! This entry was posted in Comics, Sci-Fi/Fantasy and tagged iZombie, Pushing Daisies, zombies on January 12, 2015 by Kelson. Aha! Buried in this Bryan Fuller interview on Pinnochio is some news on the Pushing Daisies comic announced last year! Yes, it’s still happening. DC wants five issues finished before they launch — understandable given the flack they’ve gotten for late comics — and they’re on #3. The big appeal in doing a Pushing Daisies comic is the story isn’t finished. The big fun in doing a Pushing Daisies comic is the story is a little darker and a lot bigger. Issue number 1 will hopefully be out in early 2011, issue number 2 is being colored as we speak, and issue number 3 is being written. Our Emmy-award-winning composer Jim Dooley and I have been talking about giving the audience a multimedia experience with the comic—specifically a score. We have no idea whether we can actually afford to do an actual Pushing Daisies comic soundtrack (because the cast has agreed to sing songs and those licensing fees are expensive), but Jim has already started composing musical cues that we will either release officially or stream for freesies online when the comic book is published. I’ve already heard the track for Lee Pace’s cover ditty and it’s fantastic. This entry was posted in Comics and tagged Pushing Daisies on September 20, 2010 by Kelson. I put the Pushing Daisies soundtrack CD in my computer and it rebooted. Fortunately it took less than a minute…. Of course I tried it again to see if it was a fluke. Same thing. Then I decided to try with another CD. Apparently any audio CD crashes it. Shows how often I use CDs these days. At least the DVD-RW drive works. IIRC it doesn’t have CD-audio hooked up, but the player seems perfectly happy to just read it digitally. I guess I’ll have to set aside some time on Sunday to figure out what’s causing the problem. It’s a bit late tonight, and tomorrow’s going to be busy! 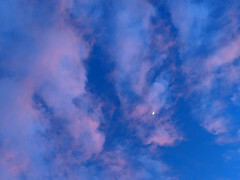 This entry was posted in Strange World and tagged crash, Pushing Daisies on January 1, 2010 by Kelson. 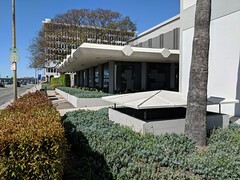 This entry was posted in Entertainment and tagged awards, Emmy, Pushing Daisies, TV, Tweets on September 20, 2009 by Kelson. This entry was posted in Signs of the Times and tagged Pushing Daisies, Tweets on September 2, 2009 by Kelson.